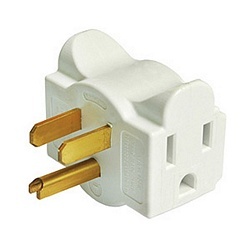 We can all use a Hug-A-Plug. Learn everything about it today! Tired of cords sticking straight out from the wall? The Hug-A-Plug fits into a regular wall outlet plug and provides two outlet adapters which allow the attached cords to run flush against the wall. The compact design works really well behind cabinets, desks and appliances. Pros: This is a quality adapter. Solid product. Pros: This product is literally amazing! Its so simple, I can't believe nobody thought of it sooner.